The years 1930 and 1931 had been good for Hitler politically. The Nazis were now the second largest political party in Germany. Hitler had become a best-selling author, with Mein Kampf selling over 50,000 copies, bringing him a nice income. The Nazi Party also had fancy new headquarters in Munich called the Brown House. Money was flowing in from German industrialists who saw the Nazis as the wave of the future. They invested in Hitler in the hope of getting favors when he came to power. Their money was used to help pay the growing numbers of salaried Nazis and fuel Goebbels' propaganda machine. 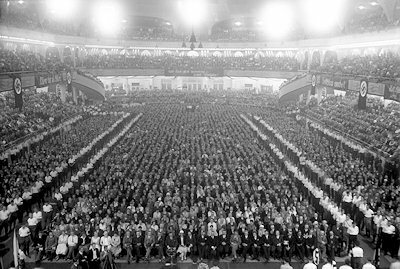 Ever-larger crowds for Hitler - the packed Sports Palace in Berlin during a Nazi campaign rally. Below: Newly elected Nazis give the Hitler salute while entering the Reichstag building to take their seats. Below: Hitler surrounded by supporters inside the Brown House, Nazi headquarters in Munich. The German General Staff was also investing support in Hitler, hoping he meant what he said about tearing up the Treaty of Versailles which limited their Army to 100,000 men and also prevented modernization. The generals had been encouraged by Hitler's performance as a witness during the trial of three young regular Army officers charged with spreading Nazi doctrines in the German Army. Hitler had used his appearance in the courtroom to send a message to the General Staff that there would be no attempt to replace the regular Army with an army of storm troopers and that once in power, the Nazis would raise the German Army to new heights of greatness. This was exactly what the generals wanted to hear. It was however, the SA, his own storm troopers, that gave Hitler problems. Many of the violence prone, socialist leaning SA members wanted to become a new German revolutionary army. 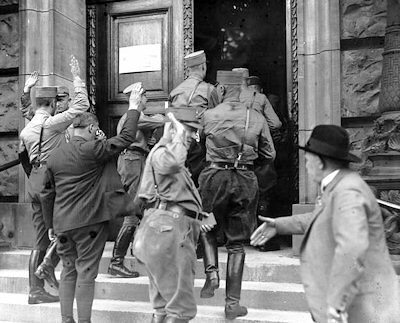 They also embarrassed Hitler by wreaking havoc in the streets despite his order to lay low. Hitler had to use his personal bodyguard, the SS, under its chief, Heinrich Himmler, to put down a small SA revolt in Berlin led by Captain Walter Stennes. 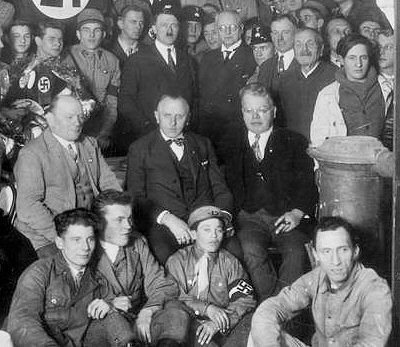 Hitler installed former SA leader, Ernst Röhm, as the new leader to reorganize and settle down the SA, now numbering over 60,000 members. The SA, however, and its leadership would remain a problem for years for Hitler, culminating in a major crisis a few years down the road. It was in his personal life, however, that Adolf Hitler was about to face a crisis that would shake him to the core. Back in the summer of 1928, Hitler had rented a small country house at Berchtesgaden which had a magnificent view of the Bavarian mountains and years later would be the site of his sprawling villa. For Hitler, then aged 39, it was the first place he could truly call home. He settled into the little country house and invited his step sister, Angela, to leave Vienna and come to take over the daily household chores. Angela arrived along with her two daughters, Friedl and Geli. Geli was a lively 20-year-old with dark blond hair and Viennese charm, qualities that were hugely appealing to a man nearly twice her age. Hitler fell deeply in love with her. He fawned over her like a teenager in love for the first time. He went shopping with her and patiently stood by as she tried on clothes. He took her to theaters, cafés, concerts and even to Party meetings. This relationship between Hitler and his niece was for the most part socially acceptable according to local customs since she was the daughter of his half sister. Young Geli enjoyed the attention of this man who was becoming famous. Strangers would come over and ask Hitler for a souvenir or an autograph while they were sitting in a café. There were also the trappings of power, SS body guards, a chauffeur, and obedient aides. But young Geli had a tendency to flirt. Although she liked the attention of this older man, she yearned for the company of young people. She had a number of romances, including one with Hitler's chauffeur, who got fired as a result. Though Hitler cast a jealous and disapproving eye on Geli's romances, he was flirting himself with a fair-haired 17-year-old named Eva Braun, who worked in the photography shop run by his personal photographer, Heinrich Hoffmann. Hitler's jealousy and possessiveness of his niece made her life increasingly claustrophobic, especially after she moved in with him to a fancy nine-room apartment in Munich. Everywhere she went, she had two Nazi chaperons and had to be back home precisely at the time her uncle ordered. She couldn't do anything without his permission. And each time she tried to get free of her uncle's constraints, he tightened his grip. 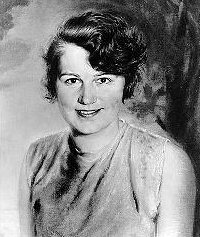 Hitler's niece and love interest, Geli Raubal. Hitler's stormy relationship with Geli worsened. There were many loud arguments. In September of 1931, Hitler ordered her to stay at his apartment and not go to Vienna while he was away. This made her furious. A huge argument followed. She desperately wanted to go. Hitler said no. As Hitler headed outside to his car to leave for an SA meeting, Geli went to the window and yelled down to him asking one more time if she could go. Hitler yelled back a stern "No!" He departed with an uneasy feeling about the whole situation. The next morning, on the way to Hamburg, Hitler's car was flagged down by a taxi. Rudolf Hess was on the telephone line back at the hotel Hitler had just left and wanted to speak to him immediately. When Hitler picked up the phone there, he was told his niece had shot herself. In a frenzy, Hitler rushed back to Munich. But by the time he got back to his apartment, Geli's body had been already removed. She had shot herself through the heart with a pistol. The love of his life was gone, and under horrible circumstances. To make matters worse, there were rumors in the press she might have been murdered, perhaps even on Hitler's orders. Hitler became deeply depressed and spent days pacing back and forth without stopping to eat or sleep. Hermann Göring would later say Adolf Hitler was never the same after the suicide of his beloved niece. Hitler later said Geli was the only woman he ever loved. He always kept portraits of her hung on the wall, decorated with flowers on the anniversaries of her birth and death. Whenever he spoke of her, it was often with teary-eyed reverence. Curiously, shortly after her death, Hitler looked with disdain on a piece of ham being served during breakfast and refused to eat it, saying it was like eating a corpse. From that moment on, he refused to eat meat.